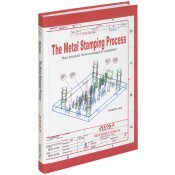 An invaluable resource, The Metal Stamping Process was written by an expert with over 30 years of practical experience, and it has been used for years as the core reference for what is widely regarded as the premier training program in this industry. With this book you will have immediate access to metalworking formulas, design standards, set up techniques, guidelines for designing and tolerancing parts, material choices, EDM, coatings, lubricants, problems and root causes, tooling tips, machine maintenance and mil standards. Also included is ProQuote, a complete and simple-to-use Excel program for cost estimating. It will help ensure that your calculations are correct and save you time besides. • The only book in the field to explain the business side of the industry, including “buy/make” decisions. • Explains how to do the same operation several different ways, as well as the pros and cons of each way. • Provides tooling tips only an insider knows. • Focuses on failure avoidance. • Contains illustrations that depict actual parts and case studies.